I met him just once. 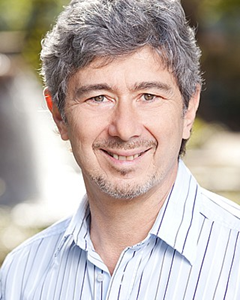 Dr. Elliot Goldner was invited to give the Distinguished Member Lecture at the Canadian Psychiatric Association’s 2015 Annual Conference in Vancouver. Before a packed room, he gave a lucid speech on the state of the system – a speech peppered with insights and statistics, drawn from numerous papers; it was mesmerizing. After, he stayed to talk with people, and I joined the group that had gathered. Late for my own presentation, I received angry texts from my co-presenter. I couldn’t resist the opportunity to talk further about the access issues that he had so clearly discussed. But if we met just once, over the years, I have read many of the papers that Dr. Goldner wrote and co-wrote. A Goldner paper – like a Goldner presentation – is impressive and memorable. Dr. Goldner died in late November. In this Reading, we look at his life and career through the comments of some colleagues. We also consider his 2011 Canadian Journal of Psychiatry paper on access and psychiatry. Psychiatrist. Professor. Vice-Dean. Researcher. Musician. He was also a father of two and a husband. After his death, Simon Fraser University posted an obituary online. It’s excellent with a solid summary of his work. The comments, too, are worth reading. Dr. Goldner’s work was diverse – so were his interests, including music. At his memorial last week, the audience included the Chair of Psychiatry at the University of British Columbia and a member of the rock band Rush. · Dr. Scott Patten, a psychiatrist and the Editor in Chief of The Canadian Journal of Psychiatry, to describe his academic work and contributions. · Dr. David Goldbloom, a psychiatrist and the Senior Medical Advisor at the Centre for Addiction and Mental Health, to comment on the person. · Dr. Dan Bilsker, a psychologist and a Clinical Assistant Professor at the Department of Psychiatry at the University of British Columbia, to discuss his work with him – and working with him. Dr. Goldner’s earliest contributions, which date back to the late 1980s, were focused on topics related to anorexia nervosa and other eating disorders – these included biological studies, clinical narratives and studies, and even clinical trials. Eating disorders remained an area of interest for him throughout his career. In the early 1990s and 2000s Elliott published important contributions on evidence-based practice in mental health and psychiatry, including influential articles on the teaching of evidence based medicine and the implications of evidence for policy. He was an early and important voice in the evidence-based mental health care movement in Canada. His interest in evidence and research methodology led to an ever-growing profile in the field of psychiatric epidemiology, a field with which he engaged with exuberance, as reflected in the title of a 2002 commentary in The Canadian Journal of Psychiatry: ‘Psychiatric Epidemiology: Vibrant Art and Penetrating Science.’ He participated in a series of systematic reviews of prevalence of various disorders, published between 2002 and 2006. More than 10 years later these remain among the most highly cited papers ever published in the Journal. He was one of the earliest and most successful users of administrative data for epidemiological purposes – charting the now dominant methods of the discipline of psychiatric epidemiology in Canada. In the last 10 years of his career he wrote about a broad range of topics, often related to evidence-based health policy, fidelity, access to health care and outcome assessment. He took on important roles with the Mental Health Commission of Canada and was involved in a large Grand Challenges project in Viet Nam – looking at low-cost, enhanced primary healthcare services for depression. All the while he continued to participate in epidemiological and policy-relevant research, including topics such as age, period and cohort effects, contemporary issues in substance dependence, knowledge translation and many others. Recently, he began working towards needs-based service planning using new approaches looking beyond the traditional ones based on diagnosis. Dr. Goldner’s academic record reflects a rare mixture of protean interests, methodological sophistication and real-world relevance. Like so many people who knew Elliot across Canada and beyond, I was stunned by the news of his sudden and unexpected death. The outpouring of sentiment and reminiscence posted on the Simon Fraser University website reflects a common theme: people who came to know him in a professional capacity as his student, mentee or colleague and then found a friend. His warmth and generosity strained the limits of his various professional roles, and the person always overwhelmed the title. Elliot and I first crossed paths almost 30 years ago, when we were beginning our careers in academic psychiatry and were both working in the field of eating disorders. What rapidly evolved between us mirrors the experience of so many who were lucky to be in his presence: a valued friendship. To know Elliot was also to feel connected to his family – his effervescent wife Ros and his then-young children, Adam and Sarah, of whom he was inordinately proud, and his gregarious father who, like Elliot, loved a good joke. In the early 1990s, Elliot was a tousled mop-top who could have passed for the fifth Beatle (and would likely have given up his day job to assume that role). While the rest of us glided into middle age, Elliot maintained his youthful mane and relentless curiosity but then was slowed down by his knee injury and its prolonged complications. However, he soldiered on; in rare, quiet moments, he shared some of the struggle and worry about his knee and its persistent problems and risks. But mostly he shifted the focus onto other people, other issues, other opportunities for him to make a contribution or to collaborate. From our earliest days of encounters at the eating disorder summit conferences he organized in the early 1990s in Vancouver (which always included a raucous party at his home) to our more recent ones when we both served together at the Mental Health Commission of Canada, seeing Elliot was always like a welcome encounter with one of your relatives who you also happen to like – a bond of deep affection superimposed on a history of shared heritage. He has left a legacy of work to his colleagues, his discipline, his country and beyond. And beyond that, so many of us cherish the memory of our personal relationships with him. I will miss him forever. Elliot Goldner and I were close friends for 33 years. We had an ongoing conversation about the relationship between psychological and psychiatric knowledge, as well as the ill-founded epistemic confidence of the mental health system. We began talking when we were finishing professional training, his in psychiatry and mine in clinical psychology. Elliot was able to maintain skepticism and openness to strange ideas throughout this extended conversation. He was not afraid of controversy and respectfully considered radical critiques of the existing mental health systems of thought and practice. His research embodied a synthesis of clear conceptualization, rigorous analysis and creative methodology. One collaboration led us to generate a critique of ‘Routine Outcome Measurement’ in the mental health system, an approach we judged to violate basic tenets of interpretable measurement. Facing intense pushback against our critique from a prominent journal, I concluded that we would never get this published – Elliot responded ‘no, we’ve hit a nerve, let’s go big – Lancet it must be’. I goggled at him, but he was right. The Lancet paper triggered excellent debate: in fact, we were invited to debate the issue at CAMH, facing off against a leading proponent of this approach. This was a great experience, one that reflected our shared belief that the halls of psychiatry should resound more with the clash of swords and less with the dull thud of consensus. A second collaboration, my favourite one, involved applying the principles of evidence-based medicine to psychiatry, an endeavour that was far from straightforward and led us deep into epistemology. It became clear that concepts like phronesis and techne were not abstruse irrelevancies but practical knowledge tools that helped us understand the complex reality of psychiatric practice. A third collaboration involved developing a pragmatic approach to knowledge translation in mental health, requiring us to cut through the seemingly endless debate about terminology to get at the essence: how to identify useful innovations, figure out who needs to change behavior, what they need to do differently, and how one can ensure that they implement the innovation properly. We produced a practical self-help guide to knowledge translation, grounding it both in consistency with the evidence and practical usability in the real world. Elliot fundamentally understood the inherent tension between rigorously deriving knowledge and communicating it in a form that will readily influence practice. His passing is a tragic loss to those who cared for him and to the field of psychiatry. Bilsker D Goldner EM (2002) Routine outcome measurement by mental health-care providers: is it worth doing? Lancet 360: 1689-90. Goldner EM Bilsker D (1995). Evidence-based psychiatry. Canadian Journal of Psychiatry 40: 97-101. Goldner EM, Jeffries V, Bilsker D, Jenkins E, Menear M and Petermann, L. (2011). Knowledge translation in mental health: A scoping review. Healthcare Policy 7: 83-98. Bilsker D, Petermann L, Goldner EM (2012). Innovation to implementation: A practical guide to knowledge translation in health care. Mental Health Commission of Canada. Access to psychiatrist services in Canada is the subject of concern as evidenced by the findings of the most recent National Physician Survey. When asked to indicate whether access to psychiatrists is excellent, very good, good, fair, or poor, Canadian family physicians most often rated access to be poor. Access to psychiatrists was rated to be worse than to all other specialists addressed in the survey, including orthopedic surgeons and opthalmologists. Similar concerns were found in a study undertaken in Ontario, in which family physicians and patients reported that they were frustrated by long waiting lists and communication barriers when seeking psychiatric assessment and treatment. However, efforts to document information about access to and waiting times for psychiatrist services in Canada have been limited by the use of survey methods that obtain low response rates. Results of the National Psychiatry Waiting List Survey, conducted by the Fraser Institute in 2009, indicate that the median waiting time to see a psychiatrist following referral by a family physician was reported to be 2.0 weeks for urgent referrals and 7.0 weeks for elective referrals. The response rate was low at 11% (n = 458) and it is unknown whether or not the survey respondents differ significantly from most psychiatrists regarding their waiting times and patterns of practice. Another survey of waiting times was commissioned by the Canadian Waiting Time Alliance and conducted by a market research company, Ipsos Reid. An online survey instrument was used to collect information from psychiatrists as well as 10 other specialist groups. Psychiatrists reported a median waiting time of 5.7 weeks for people with MDD from the date of referral by a family physician to the date in which they were seen by the psychiatrist. A response rate of 14.6% was reported for the survey. Owing to the low response rates obtained in these surveys, it remains unclear whether the survey findings provide representative estimates of waiting times for psychiatrists. In our study, we aim to improve the quality of information obtained regarding psychiatrist waiting times by use of a novel methodological approach in which accessibility and wait times are determined by a real-time patient referral procedure. So opens a paper by Goldner et al., published in 2011 by The Canadian Journal of Psychiatry. · Drawing on a real case, a research assistant contacted multiple psychiatric practices asking for an appointment. · The research assistant attempted to contact all the psychiatrists in the Vancouver area (as listed in the medical directory of the College of Physicians and Surgeons of British Columbia). · Calls were made over a four-day period. Follow up calls were made over a three-week period. · A “semi-structured call procedure” allowed for information to be collected for office assistants and psychiatrists that responded: the availability of the psychiatrist, waiting times, the availability of CBT. 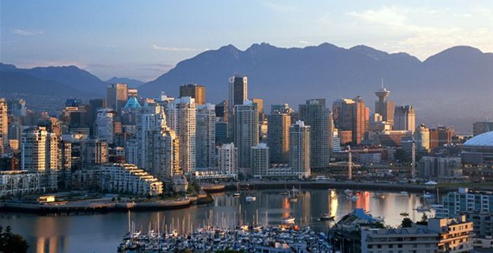 · 297 psychiatrists were listed in the Vancouver area. 230 (77%) could be contacted. · 521 calls were made in total, with most offices receiving one or two calls. · Declining the referral. Of the 230 psychiatrists who were contacted, 160 (70%) wouldn’t accept the referral – some of these psychiatrists had closed their practices (7%) or had other duties like research (4%). 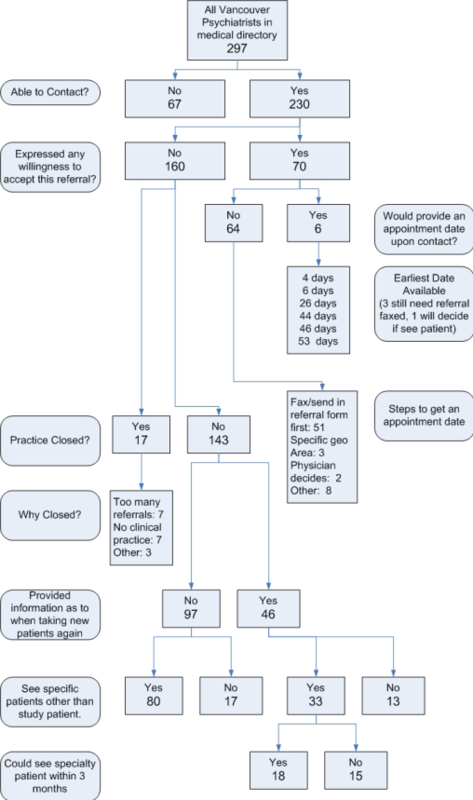 Of the 143 in clinical practice, 97 declined to answer when they would be able to take such a referral. · Potentially accepting the referral. Of the 230 psychiatrists contacted, 70 (30%) responded that may be able to accept the referral. Most would not commit to a date following receipt of a referral form (64 or 91%). 6 psychiatrists (9%) provided an appointment within 4.5 weeks; the median waiting time was 31 days. See figure below. 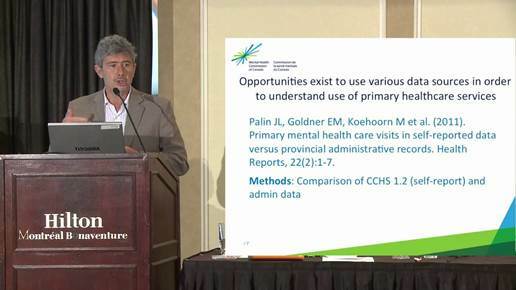 In conclusion, there appears to be a compelling need to examine the current interface of primary and secondary mental health care services in Canada. 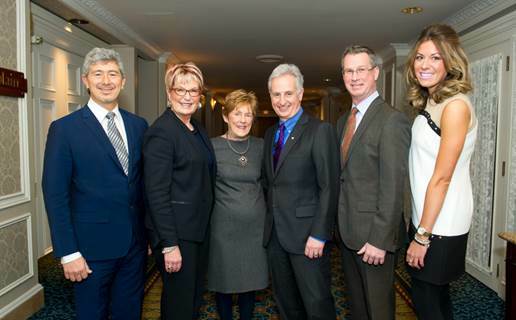 Despite efforts to raise awareness of these issues, and progress toward improved collaboration and efficient service delivery that have been accomplished in some jurisdictions, consolidated efforts to improve the unacceptable status quo in access to mental health care are required in Canada. 1. This is a creative and impressive paper. 2. This is one of several papers that have been published in recent years on access. Collectively, they have helped us move beyond what we think – there seems to be a problem with access to psychiatric services – to a discussion guided by data – this is what we know about access to psychiatric services. This paper in particular shows the deep problems with access to psychiatric care in a major city. Published in 2011, it has helped to change the debate. It’s important, and I consider it a classic. 3. Medical papers are often understated. Still it’s difficult not to feel the sting of the concluding comments. “The unacceptable status quo in access to mental health care” – strong words, but they flow from the data.